The Maharashtra Water Resources Regulatory Authority calls a halt to the privatisation of the Nira Deoghar dam, citing contradictions in the laws governing water management. Shripad Dharmadhikary reports. 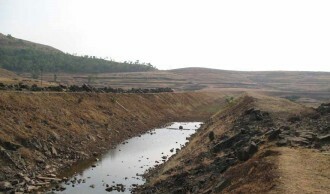 On 18 September 2007, the Maharashtra Krishna Valley Development Corporation (MKVDC), a state-owned company created to develop irrigation projects in the Krishna Basin in the state invited Expressions of Interest from private companies to complete the partially built Nira Deoghar dam and irrigation project. It was proposed that the selected private party would run the project on a Build Operate and Transfer (BOT) basis. With the government already having spent Rs.468 crores out of a total outlay on the project of Rs.1490 crores, the private developer was expected to bring in close to Rs.1000 crores. With this, the Nira Deoghar project was all set to be not only India's first privatised irrigation project, but also the biggest in the country involving privatisation of water resources. Now, however, more than a year later, the Maharashtra Water Resources Regulatory Authority (MWRRA) - the first independent water regulatory authority to be set up in the country - has issued an order asking MKVDC to withdraw the notice inviting the expressions of interest, effectively putting on hold the process of privatisation that had been inching along. This ruling of the MWRRA, and the fact that even a year after the EOI had been invited the project had not proceeded very much demonstrates not only the policy confusion surrounding privatisation in the water sector but the fundamental difficulties involved. The Nira Deoghar project consists of a 59-metres-high, 2320 metres-long dam on the river Nira, located about 90 kilometres south of Pune near the now displaced Deoghar village. The dam, almost 95 per cent complete several years ago, has a total storage capacity of 337 million cubic meters. The project envisages two canals, a 208-km right bank canal and a 21-km left bank canal, along with 4 lift schemes. The project is expected to irrigate a total of 60,580 hectares. When the privatisation process first came to light, it caused great anger and apprehension among the farmers who were to receive water from it. One of the key concerns was that irrigation tariffs would rise as a result of privatisation, since water charges were one way for the private developer to recover his investment. An earlier article discusses in detail these concerns and other problems of the privatisation of Nira Deoghar project (see here). The fact that even a year after the EOI had been invited the project had not proceeded very much demonstrates not only the policy confusion surrounding privatisation in the water sector but the fundamental difficulties involved. The MWRRA was established by the Maharashtra Legislature in 2005 (vide the MWRRA Act) and is given wide-ranging powers including the setting the water entitlements for a variety of users, setting bulk tariffs, clearing new projects etc. The Authority got involved in the Nira project when Prayas (Resources and Livelihoods Group), an NGO based in Pune, filed a petition on 18 January 2008 with the MWRRA raising several issues regarding the privatisation. The GR permits the private developer to make changes in the quantum of water to be supplied to various users, while the MWRRA Act vests the powers for this in the Authority. The GR permits the developer to recover capital costs through water charges whereas the MWRRA Act stipulates that only Operational and Maintenance charges can be recovered through user charges for water supply. Several other issues were also raised by Prayas. After a series of submissions and hearings involving all the parties, the MWRRA upheld the major contentions made by Prayas, and ordered that "The Respondent MKVDC shall withdraw the advertisement [inviting the Expressions of Interest] within 15 days from the date hereof and shall not re-advertise until such time as the Government Resolution dated 15-7-2003 is revised." It also ordered that while revising the said GR that enabled the privatisation process, the Government should lay down in clear terms the role of the MWRRA in the privatisation process, including in fixing criteria for selection of project and the developer, vetting the revenue model, fixing entitlement of various users, allowing permissible changes in water tariff rates and vetting of revenue model finally selected for approval. In the first instance, this order demonstrates the policy confusion related to privatisation in the water sector. The contradictions between two instruments - the GR and the Act - of the same Government are indicative of this confusion. One of the reasons for this confusion could be that many of the changes in the water sector leading to privatisation and commercialisation are being brought in at the behest of the World Bank and other international agencies. The MWRRA Act was passed as a precondition to a World Bank loan to the state; the state of U.P. passed a similar Act a few months ago as a part of a World Bank loan condition, while M.P. had prepared a draft of its own Water Regulatory Commission Act as required by another World Bank loan. When such laws and processes are imposed from outside, it is natural that they may not lead to well thought-out and comprehensive measures, but rather to ad hoc patch-work of instruments, provisions and institutions that could even contradict each other. The order also brings out the problems inherent to privatisation in the water sector. For one, the private developer will want to recover his costs and make profits; this means that tariffs for water could rise sharply. With farming already in the doldrums, this could make it economically unviable. To take off some pressure from the water tariffs, other ways of recovery are also suggested, such as levy of water charges for irrigation and domestic uses, fisheries development, tourism activities, etc. associated with projects, and through contract farming in the command area. This in turn means that many public goods will be handed over to private corporations for their profits in addition to loss of sustenance livelihoods for fisher people and others. The MWRRA Order states that "Certain benefits were contemplated by the Government to the farmer when the project was cleared as a budget financed project ... The BOT process had to therefore ensure that the newly envisaged revenue streams do not lead to reduction of these in any way." What the MWRRA has not mentioned, but is equally important is that the BOT process should not divert other public goods and sources of livelihoods to support the BOT. Partially built canals of Nira Deoghar. The most important implication of the order, however, is that it has created an opportunity to review and rethink the process of privatisation of water resources in the state. The MWRRA specifically directs the MKVDC to seek a review of the 2003 GR which lays down the policy and terms of privatisation, to remove the contradictions between it and the subsequent Acts. However, it would be wise for the government not to limit this to only removing contradictions, but rather reviewing the fundamentals themselves. After all, if not a single irrigation project has yet been successfully privatised with the GR now being in place for 5 years, it has clearly failed to deliver and needs a rethink. As Sachin Warghade of Prayas points out, "This can be an opportunity in case of current order, because the issue has been pushed back to the level of policy formulation ... demanding for public process on policy in the current situation." Indeed, the MWRRA also writes in the Order that "... in the process of revision of the GR it would be in the interest of the Government to invite constructive participation from stakeholders while designing a more updated PPP [Public Private Partnership] policy", a somewhat ironic statement considering that neither the MKVDC in its process of inviting and processing the EOI, nor the MWRRA in its entire hearings on the matter have involved the people likely to be affected / benefited by the Nira project and its privatisation. However, this can be corrected even now. With the process of privatisation of the Nira project itself being stalled, it is important to review the approach to privatisation of water resources in the state with public debates and discussions involving the people of the state extensively.